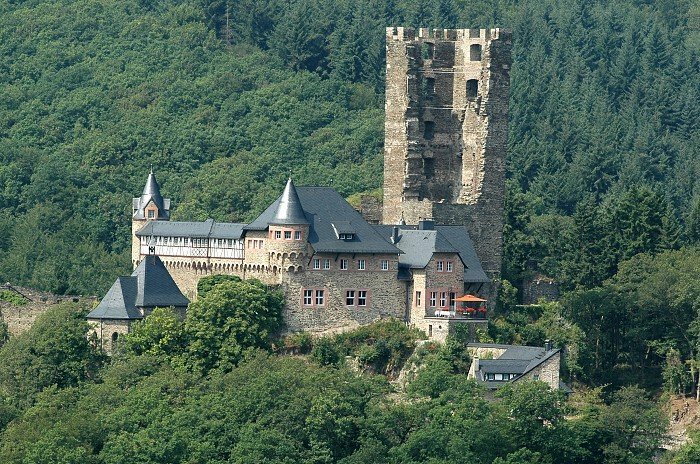 This ruined 14th-century castle in western Germany is now used as a hotel for the picturesque region that is designated a World Heritage Site. Located on a hilltop overlooking the town of Sauerthal, fortifications at this site date back to at least the 13th century. In 1355, the Archbishop of Mainz granted Rupert I “the Red”, Count Palatine of the Rhine, “to built a castle which is called ‘Surburne'”. The castle remained in the hands of the Counts until the 16th century, and after exchanging hands with other noble families, suffered a devastating blow in 1689 when troops of the French king Louis XIV set fire to the fortress, leaving it in ruins. It was not until 1909-1912 that efforts were made to restore the castle, and in 2004 further renovations led to the site being used as a hotel. Events also take place on the castle grounds, including wedding receptions, medieval markets and classic car rallies. For more details, please visit Sotheby’s International Realty or the castle’s own website.